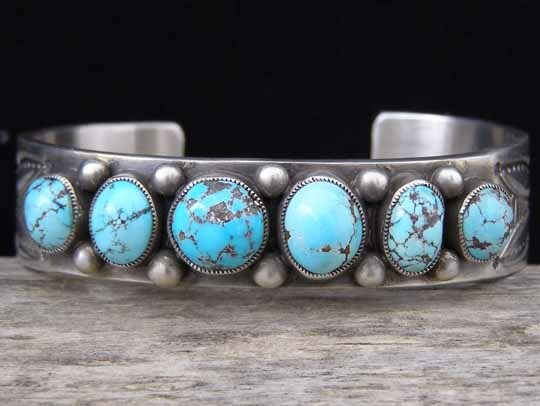 Calvin Martinez Persian Turquoise Graduated Row Bracelet size 6 5/8"
This is a splendid graduated row bracelet by Calvin Martinez set with six stones of natural, untreated Persian turquoise. These are high-domed stones of a cut commonly practiced by lapidaries in Iran cutting the native turquoise. The stones are set in handmade serrated bezels and raindrops are interspersed between the stone settings along each edge of this uniform-width cuff. Past the stones, Calvin decorated the cuff with dragonfly wings motifs, a symbol of eternal life. Uniform width of cuff: 9/16"